Nourish Us: Merry Christmas Everyone! One of the important ways that families can stay connected is by sitting around the table enjoying good food, sharing memories and laughter. We two cousins, Kimberly Kay and Meliors, have set up this website as a way for our far-flung family to share some of the pleasures of food and fellowship with eachother. Whether we are cooking in New Zealand or eating in New York; sharing meals with an extended family in Arizona or snacking in solitude in Florida, we can use this blog as a fun and delicious way to stay connected. The theme is food and fellowship. 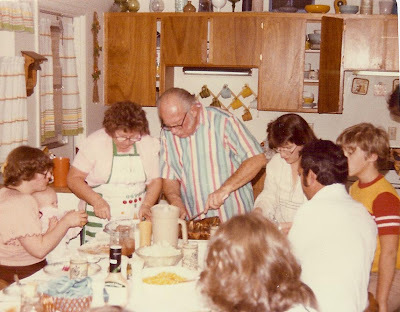 We want you to contribute blog posts here: recipes, photos, memories, stories, songs and jokes from the Kellerman table and from other family tables you have enjoyed. Even if you never shared a meal with Jess and Ada Ruth, or your relationship to the Kellermans is but a distant twiglet on the family tree, we would love to have you join this party. Don't be shy, if you have never blogged before, this will be an easy way to try it out. If we already have your email address you should be set up to post to this blog. You just have to log in at www.blogger.com. If its not working, just email Kimberly or Meliors and we'll gladly help you get started. So, please, get out your handwritten recipe books and share a dish, with a photo or memory. Wow! Thank you both so much for creating site. Congratulations to Kimberly for the birth of Ada Ruth. You were such a beautiful pregnant woman. And to Meliors, I googled your name and found your blog. I have been reading your stories for some time now and they make me happy. You have such a gift.